Métamorphose. Design Local ! Ou la rénovation selon les usagers – Metamorphosis. Local Design ! Or renovation according to users. Métamorphoses. Design local ou la rénovation selon les usagers aimed to redevelop the working room of Mutual aid group (GEM) Lucien Bonnafé by adopting a participative approach. GEM is a support structure, a place of welcome and activities for people with mental problems, often isolated, who need to find out soothing and reassuring landmarks. The urgent need to renovate the working room of the association, old and inadequate, is the origin of this operation. Poor lighting, inadequate storage, overabundant furniture, nonexistent privacy area, display area and signage absent : the development weighed on all users, members as organizers. How, indeed, improve mental health, give again confidence to individuals and encourage discussion in these conditions ? Assisted by organizers’s association, the designer Julien de Sousa was first invited users to observe and diagnose dysfunctions and qualities of the place. Through the right tools, he led them to generate ideas, make proposals, imagine scenarios and choose what could be carried out. Also involved in the project, users’s GEM took part in the entire process of renovation. GEM’s users (about fifty persons). Design is at the heart of the process, initiated since the start by a designer in the Cité du design, the whole methodology is based on the design practice. The renovation project is led by a other designer, from the observation of uses, conducting awareness workshops to design and participative design from users to the project design (scenarios and plans) then realization with monitoring the work. 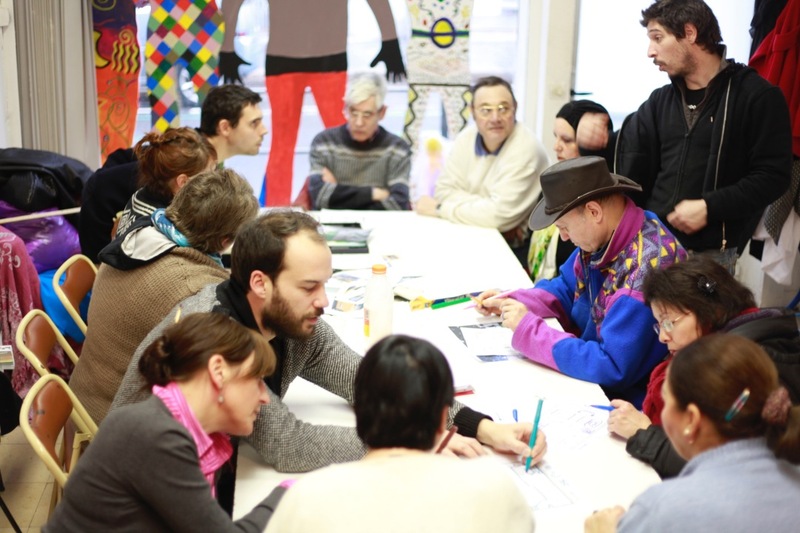 The innovation is in the approach and methodology in place : this is the first time an association that uses the design to work with people with psychological difficulties in a renovation project is also the first time the Cité du design and the designer get involved with this type of public. It is the network of these actors that make Métamorphoses. Design local ! ou la rénovation selon les usagers exemplary cooperation project.